Welcome, and thanks for coming. As you flip through the pages of my website, I’d like to draw your attention to a few of the things I’m working on. First off, my fiction. I’ve posted some free chapters, and in the coming months I’ll be releasing two novels, at least one with a release date sometime in 2014. Second, if you’re here because of my Skyrim articles, take a look at the iPhone app I developed. 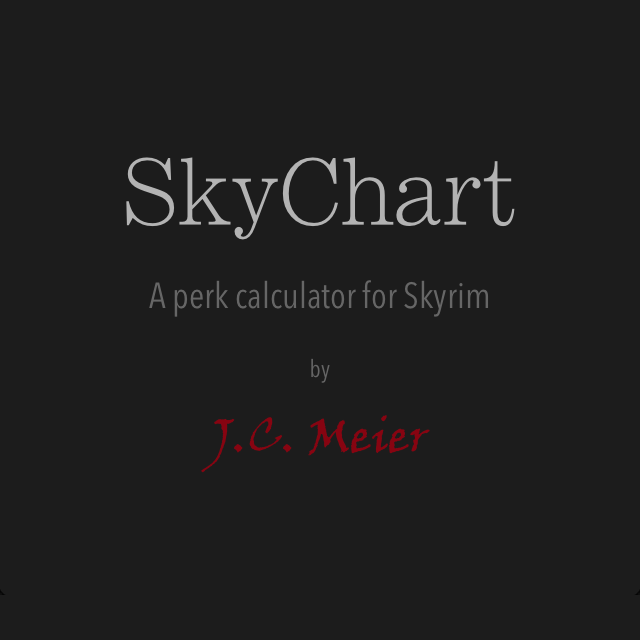 I call it SkyChart: A Perk Calculator for Skyrim. Next, you might be interested in reading my blog. It’s still young, but it’s growing. I’d be very interested in hearing your feedback on all of the above. A good way to reach me is on Twitter, @JeffCMeier. I’ll be announcing more projects in the future—I hope you like them.